In 13x9-inch (3-quart) glass baking dish, place gelatin; pour boiling water on gelatin; stir until gelatin is dissolved. 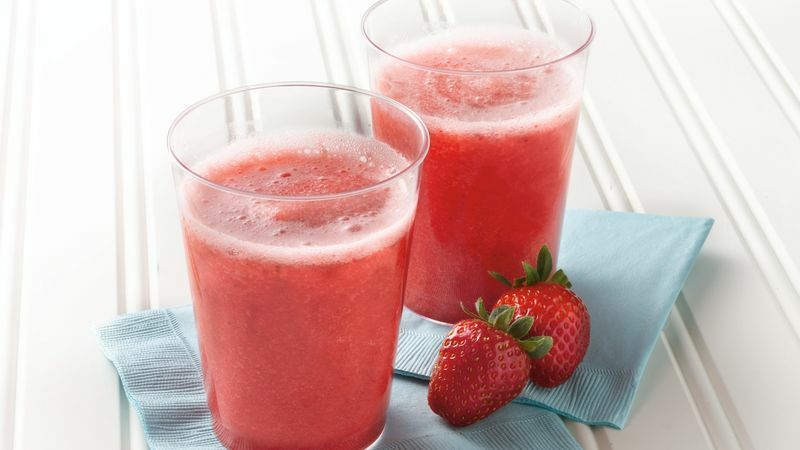 In food processor, place strawberries in syrup, fresh strawberries, lemonade concentrate and sugar. Cover; process until smooth. Pour into gelatin. Stir in 1 bottle hard lemonade. Freeze 4 to 6 hours or overnight until slush consistency, stirring after 2 hours. To serve, spoon 1/2 cup slush mixture into each glass; pour 1/3 cup hard lemonade over each. Stir and serve. If you don't own a food processor, use a blender to blend the ingredients in batches.